Quick-release mounting fenders provide hassle-free installation on virtually any bike. Extra-tough Superflex polycarbonate construction holds up mile after mile in the worst weather conditions. Designed to fit touring or mountain style bikes. Black. 45mm width: Fits tires up to 700c x 35mm or 27 x 1 1/4"
60mm width: Fits tires 26 x 1.75" - 2.25"
I love these fenders - the 45mm fit perfectly on my cx race bike to turn it into a commuter. It's easy to extend them a bit in the back by attaching a piece of flexible plastic folder from office depot. These were perfect for my touring bike (a Sakkit) that didn't have the crown eyebolts required for traditional fenders (mudguards). The fender stays attach to the forks chainstays using rubber clamps, these are very strong and robust, so you needn't worry about them coming loose. The fenders are lightweight but strong, and the installation process is very easy - it took me probably no more than ten minutes to attach the set of two. How did they hold up? Well, they performed fine - I shipped my bike in a cardboard box to Austria, cycled into Switzerland and France, over mountain passes, took the bike on a few train trips, and flew back from Nice to New York, again with the bike in a box. The fenders were undamaged and still as strongly attached as when I first installed them. Highly recommended. I have rode with these fenders for two months until the snow came. I did not get into any real rain to see the extent that these fenders would block the thrown water and spray. The added weight is noticeable but not extreme. Any fender adds mass to your ride. I use this bike mainly for the work commute each day while its not snowing so some weight is ok. Mounting these fenders is not a bad task. I had no problem with the front fender install. The rear fender took me a while to finesse it into the frame and eliminate the tire rub. I had to install a rope from the brake mount to the fender to raise it up enough to stop tire rub. Some adj could be done by tweeking the stays, but for my frame it was not enough. I do have some rattle on rough roads but its OK. The time to mount the fenders the first time was about 45 min. I do like these fenders so far. Removing them should be about a 5 to 7 min process and same to reinstall them. I like them better than the older sets of fenders I have owned, different brands. This is a good option if your frame does not have mounting points. A bit tricky mounting the fenders on my Cannondale Synapse road bike but once in place the fenders are stable and do the job just right. Difficult to mount on my small road bike frame and the fenders collect mud and grit, eventually rubbing against the tires. Solution keep the fenders clean! I was able to get these on my 2018 specialized diverge women's E5 Comp! It was hard to find a fender that would work because the diverge doesn't have cailper brakes, and my diverge has a rear rack. Anyway the front fender went on easy here, and I screwed it into the bolt on the underside of the fork. The backside was a bit more tricky, to make it work I had to bend the metal, which was doable with just my hands. After that I had to zip tie the bracket near where a seat stay would be, but overall it wasn't hard and now they look great!! These good looking pair of fenders keep the spray off your face and stripe off your back. Installation was moderately easy and removal quick. The picture of the front fender shows a small bracket for stabilizing fender, but was not included. 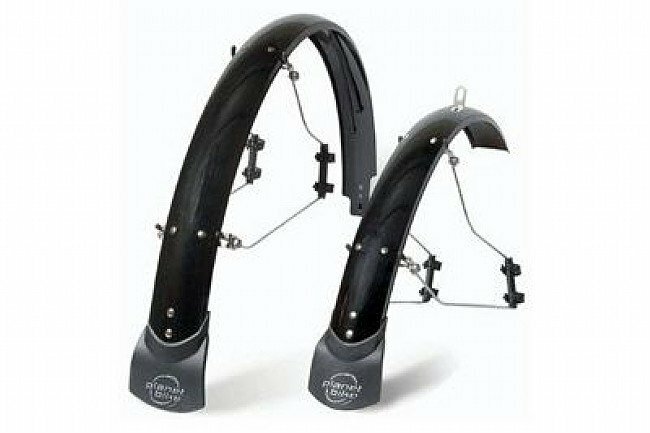 However I would still recommend this portable pair of fenders for in-climate weather bicycle rider. And they keep you dry. Yep, nicely design, very light, little bit of a pain to place them in the proper position but I also blame that on that fact that my tires are way bigger that the ones this fenders are designed for, I was expecting that to happen as I'm planning to get thiner tires once the current ones worn out. Keeps the rain off my backside. These installed quickly and have great coverage over the tires. They're also sturdy and don't bounce around noticeably when I hit the bumps in the road. I can't speak about how well they keep the water from spraying up and hitting the riders behind me, but they do a great job keeping me protected from road spray as long as I'm not riding through the deepest of puddles. While they are easy enough to install, I had to play around to get them to mount properly without interference on my Mtn. bike. Plus they rub at times when going over bumps. Overall, for the price they are above average and they do their intended job. I originally bought the SKS Race Blades, but needed more coverage and a better fit. These obviously take more time to mount, but they reward you with better coverage and greater flexibility. Mounting to my Ridley CX bike was about a 2-3 beer job, and all the parts were of solid quality. Adjustability is great- I can run race tires or slide the fender out for 700x35 CX tires and still have enough clearance. And while I'm all about keeping used ketchup bottles out of the landfill, I happen to like the fact that the rear fender comes down far enough to eliminate the need for a ghetto fab buddy flap.